Liverpool career stats for Walter Wadsworth - LFChistory - Stats galore for Liverpool FC! Before the likes of Gerry Byrne, Ron Yeats, Tommy Smith and Jamie Carragher, the defender who had his opponents shaking in their boots was Liverpool's original hard man, Walter Wadsworth from Bootle. After reading through several match reports at the time it becomes quite evident that Wadsworth was the quintessential tough man who referees had on quite a few occasions give a talking to because of the severity of his challenges. Wadsworth wasn't though just going around kicking people and was quite an accomplished footballer. Wadsworth was at the heart of one of the best defences in the history of the club with Elisha Scott, full-backs Ephraim Longworth and Donald Mackinlay and his fellow half-backs Jock McNab and Tom Bromilow. Equipped with this excellent back five Liverpool won and retained the League championship in 1922 and 1923. Wadsworth's temper tended to boil over on the field to his opposition players' suffering, but the fans of his adversaries also had to watch out. 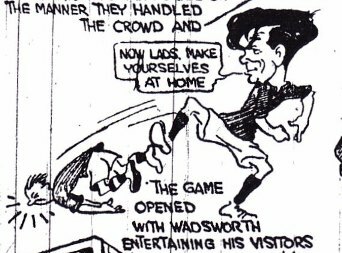 Spectators gave the players an ear-bashing as well back then and in one particular game against Sheffield United on 1 December 1923 at Bramall Lane Wadsworth snapped when goaded by a United fan. Wadsworth was unrepentant about this incident as evident by his article in the Topical Times, which was published the following week: "Let me state here and now that I hit a spectator, I admit it. I think I was justified because a spectator called me something that I will allow no man to call me. It must not be imagined that because a spectator has paid his bob that he can, willy-nilly, help himself in the epithets department. He has no justification for something worse than swearing at the players. He has not the right to shout vile words at them. I hope the action I took will lead to the offenders realising that they cannot lean over the railings and offer vile insults at footballers. After the match I begged the people of Sheffield to bring the man to the dressing room to see me. No-one came, I am sorry to say, and I am more than sorry that the man has not gone to court, for then the facts would be published and it would be seen by all in the game of football how some spectators carry on." Wadsworth portrayed as tackling a bit high in this instance! In his obituary it was said that one of his slogans were: "Ball may pass me, but man never!" Wadsworth's career low came on 14 February 1925 at Anfield. 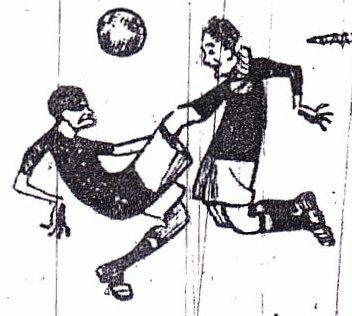 Newcastle's Urwin threw mud at Wadsworth who in return punched him in the face. Wadsworth was banned by the League for the remainder of the season and only made a further four appearances for Liverpool before signing in May 1926 for Alex Raisbeck's Bristol City at the ripe old age of 36. He became Bristol City's captain which won Third Division South and also featured in 27 second division games. He played into his 40's with Oswestry Town. A tremendous competitor who never gave in for Liverpool's or any other team's cause! Sunderland legend and England player Charlie Buchan described Wadsworth as the most difficult half-back he had faced. "You never know what he's going to do next. He's so unorthodox and seems to 'get there' without disclosing his intentions." Walter Wadsworth was a commanding centre-half who played in 74 out of a maximum 84 matches when Liverpool won and then retained the League championship in 1922 & 1923. "As a centre-half Wadsworth is now one of the hardest nuts an opposing forward can expect to meet."